"These are my husband's favorite kind of wings. Easy to make and delicious. They taste even better if you double the sauce and marinate for 24 hours." Whisk together the soy sauce, brown sugar, sherry, mustard, and garlic powder in a bowl. Arrange the chicken wings in a 9x13-inch baking dish, and pour marinade over the chicken. Cover the baking dish with plastic wrap, and marinate in the refrigerator for at least 2 hours. Preheat an oven to 375 degrees F (190 degrees C). Remove the plastic wrap from the baking dish. Bake in the preheated oven until the chicken wings are no longer pink in the center, about 1 hour, basting occasionally. Loved by all. Marinated 24 hours, perfect results. 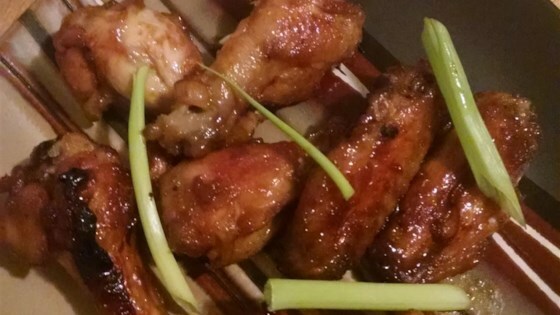 I made about 40 or so wings with this recipe during the Patriots super bowl win. All my friends loved them. The party was about 9 people.